Passion is a state of being. In that state we flourish, our energy flows. Obsession is a state of being. In that state energy is wasted. Obsessive thought is a hook that can take the lead in our life and drag us anywhere. It can be a person, desire, or situation that incessantly bubbles and boils beneath the surface. We can’t get rid of it. The more we react, the deeper the hook embeds in our psyche. Jealousies, competition, differing agendas can turn relationships into horribly toxic experiences of obsessive thought. When these relationships are in the workplace there is no place to hide. The consequences of being in an obsessive state are real: stress, health issues, accidents and errors. I had this frustrating experience with a colleague. At the end of the day I arrived home feeling drained and yes … obsessing. It was bad. The situation and toxic feeling shadowed me morning, noon and night. I so wanted to get back to my flow and passionate state. Nothing was working to unhook my psyche from the issue. If ever a “power up” was needed this was it! I mentioned my dilemma to a Peruvian healer and she replied: “Ho’oponopono”. In essence, it translates “to make right and put in order”. My mission became researching Ho’oponopono. This practice originated in ancient Hawaii and was adapted for contemporary culture by kahuna Morrnah Simeona. Morrnah taught this practice throughout the world until her passing in 1991. Perhaps living in community on an island is a mindset of deeper connection to nature and one another than the one that is based on a vast landmass of hiding places and escape routes. In any case, I was open to new ideas and ready to begin a new practice and experiment. 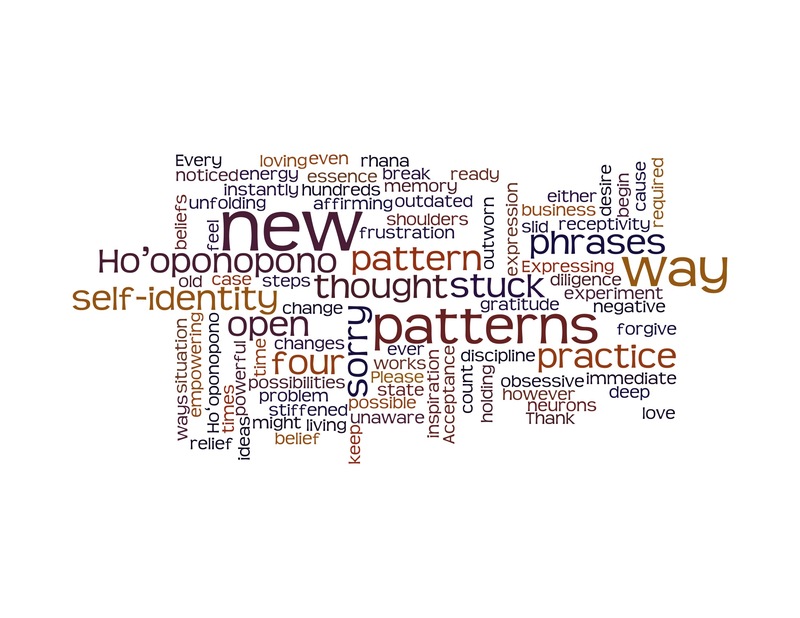 Ho’oponopono is a way to break a pattern of obsessive thought and negative self-identity. In essence we are either stuck living in a pattern of memory or in the state of inspiration and ever unfolding and loving self-identity. It required diligence, discipline, a deep desire to change the energy and a belief that it was possible. I stuck with the practice and noticed immediate relief. Every time the thought and frustration slid into my neurons and stiffened my shoulders I said the phrases. I didn’t keep count, however I might have said them hundreds of times over the emotional situation at work. 1)”I love you.” This powerful expression changes how we feel instantly. 3) “Please forgive me.” Acceptance that our outworn beliefs and patterns are the cause of the problem is empowering. 4) “Thank you.” Expressing gratitude is a way of affirming our receptivity to new ways of being. My energy, passion for the possible and clarity returned. In two weeks the issue resolved. An epic win! Next win: finding a way to make this a part of employee education and staff coaching programs…..without seeming woowoo. Ho’oponopono is another wonderful tool for bringing our best to life and changing our relationships to other people, our own body, our work, etc. Previous Previous post: What Is Your Epic Win Today?